I’ve navigated the teaching profession intuitively, always gravitating to what I sensed were voids in the system that, more often than not, compromised students. My rewards have not been monetary, nor have there been accolades showered on me – a special chair, a title, the such and such professor of. No. I’m nowhere near a think tank and the leisured life of, well, thinking and writing. None of this has happened. Mine has been a bumpy road – humbling in many respects. Some might even say I live on the boundaries of academe, shunning careerism – no publishing in obscure journals, no writing unreadable books, no clawing up the expected ladder to obscurity. I’ve done none of it. I’ve focused on students instead – and there’s a price to be paid for that. But the rewards for this focus occupy my office shelves —objects the students have given me over the years. They are testaments to the significance of shared learning moments otherwise muted by the hallowed ivy. Objects are aesthetic records of the deeply emotional link between the past and the present. Objects say something of our need to regain something of ourselves – something lost, perhaps, what memory is; they’re even about something we yet don’t know we’ve lost, something of a nature we’re yet unsure of. Something needing discovery. Objects point to the past, but to the future as well. And they emphasize how ephemeral time is. Yet – while these objects are incredibly intimate accolades, they also signify how my dreams were held in check by my sense of responsibility to others, to the commitment one makes to someone else’s desires – a young dreamer’s. In these objects is a teaching life; they are portals into the difficult work of helping young minds integrate into culture – and of how a teacher evolves with students. Life is Just a Bowl of Varies – Sid was an older gentleman that followed me around from course to course. And one day, when he was done with his schooling pastime to idle away hours in retirement, he handed me a bowl comprised of various dice. LIFE IS JUST A BOWL OF VARIES was printed on a card – that’s all. He was telling me that life is varied, diverse – and that it might diverge from my plans. I sensed this. I fell into teaching; it was never planned. Many people don’t plan on becoming teachers – at least none that I knew while at grad school. Some go into it because it’s the final, common denominator; others continue down a path (mine was “the writing life”) unaware that the teaching profession would grab hold of them, a safety net of sorts. I thought I was going elsewhere. Sid must have navigated many divergent paths. He taught me something – something to expect. Sid sat in the back of the class, usually next to other retirees that came to listen. I had no idea whether they read the material or whether they’d read the material in another life. Seldom did these folks say anything, giving space to the young undergrads that had to take my course. It was after class that one or two of the retirees would come up, thank me for the lecture and tell me whether they liked it or not. It was good today. This is when Sid, one day, came up and said, You’re an iconoclast. I smiled. I wore it like a badge of honor, a purpose for my teaching life. I started teaching in 1985. I taught at SUNY College at Purchase from 1987 to 1996, two nights a week, three hour classes, and sometimes a three hour day class. I had to work to pay the rent, so SUNY was how I read the texts I needed to complete my PhD (I also taught at Manhattanville College at the time – 1986-1995. The life of the adjunct.). Introduction to American Literature. Literature of the Modern Age. Sexuality, Morality and Aesthetics in English Literature – 1880-1923 (drew a strange crowd, especially at night). Literature of Discipline and Punishment. Poor Sid, looking back, sat through most of these and watched an inexperienced teacher stumble his way through. I suppose Sid saw something, which prompted him to give me the dice – LIFE IS JUST A BOWL OF VARIES. It’s turned out to be true. Everything for me has been about change and adaptation. Sid was right. I keep his bowl prominently displayed. 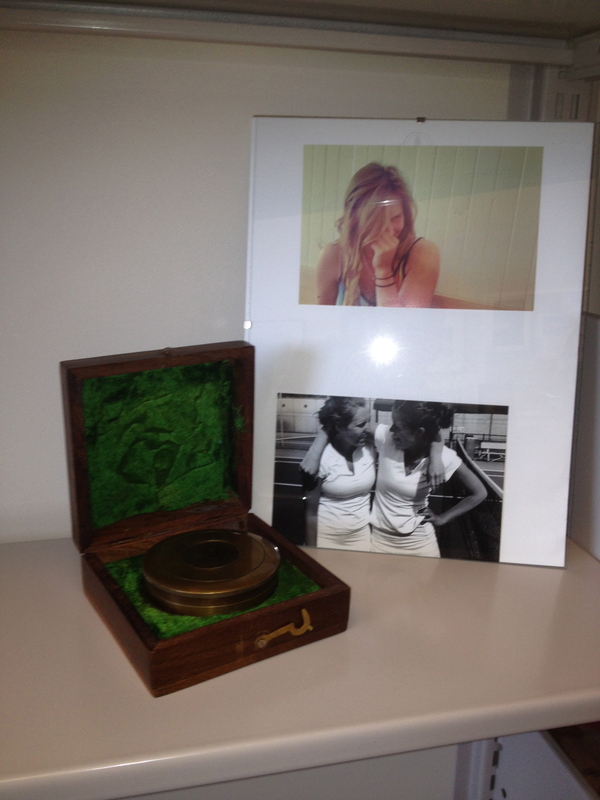 The Compass – Leah, in the picture, now a teacher and a tennis star, too, sent me, most recently, the antique, Stanley London, brass compass. Inscribed inside the top of the compass is Robert Frost‘s The Road Not Taken (1916). You know it. Leah sent me The Compass not long ago. It sits opposite Life is Just a Bowl of Varies. The space between them is a traveled life. I think it’s both: in trying to find paths for students to fulfill dreams, I’ve found my own. We’ve both used the compass. We still need it. Then there’s Frost. Two roads diverged in a wood, and I – / I took the one less traveled by,/And that has made all the difference. When I’ve traveled down a path a frightened student puts forth, this has been a road that diverges. I’ve gone down many a scary road with students; we held on. Eventually I’ve tried doubling back. But that’s been impossible. “Back” is never a return; it’s a moving away, sometimes with regret and sorrow, always with something new in the horizon. It’s good to have a compass. Heraclitus said, “Things keep their secrets.” The challenge with objects. 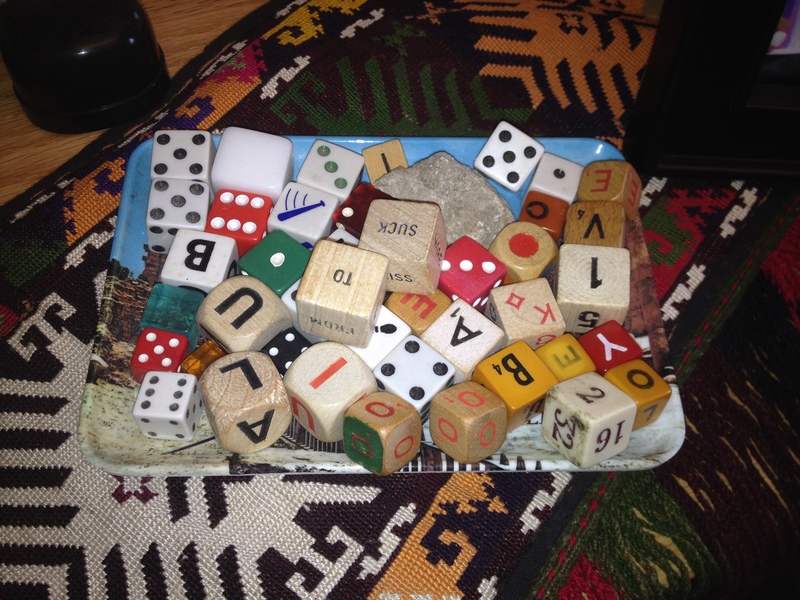 Dice are small throwable objects with multiple resting positions. Like us, humans. Only we seem to land in random places, occupying arbitrary positions. We need navigational instruments that show directions and give a frame of reference. Object lesson 1: the objects of my teaching life represent a rejection of the “known way,” an understanding that we are always in “an impasse” – but that at least two are needed to break through the gridlock, the predicament, the jam. The hats and scarfs from Afghanistan, the elephant from Sri Lanka, Chinese objects, cards from all over the world – Thank You! Professor – all of these objects hold time. They speak of the impossible. Scary journeys taken side-by-side when no one was watching. These objects are symbols of always diverting plans that asked for different commitments, and once the commitments were made, as Frost says, I doubt if I should ever come back.